We have already discussed about task lists in earlier post. 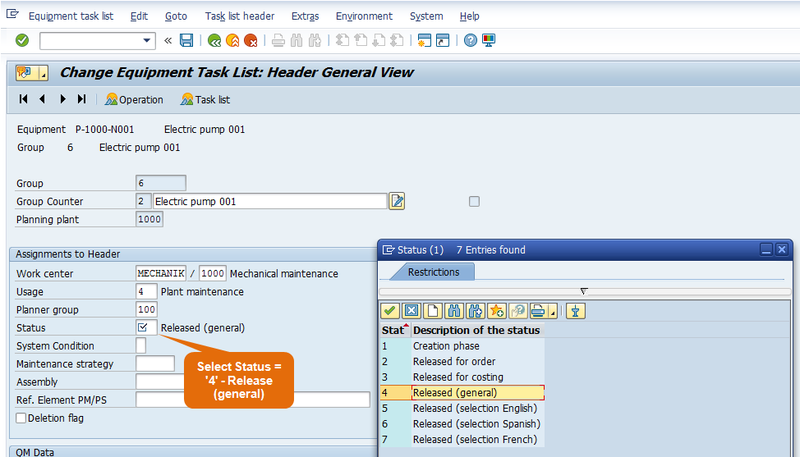 Now we will focus on Equipment Task List in SAP PM. 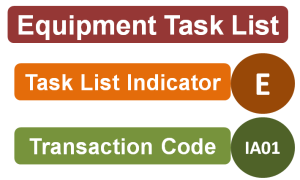 Equipment Task List is widely used in the preventive maintenance and routine maintenance of critical and unique equipment, which requires some special maintenance operations to be performed at scheduled intervals. Suppose a maintenance work is to be performed on an equipment and maintenance tasks are specific (not general) to that equipment. In such a situation, we use equipment task list. 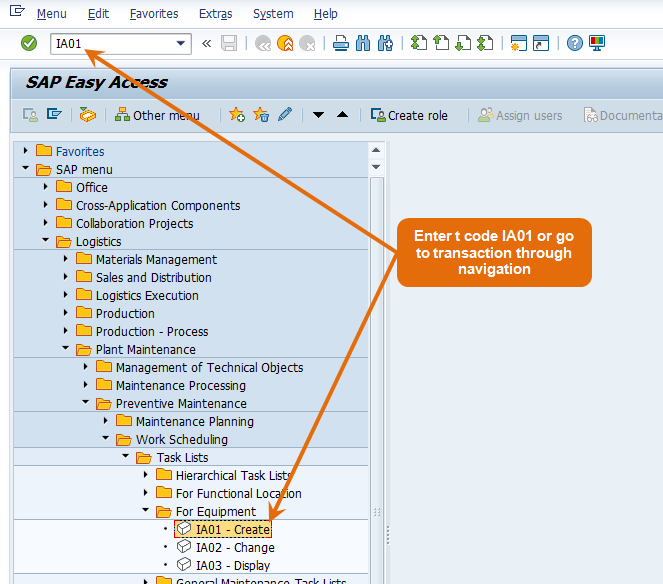 Step 1: Run t code IA01 or go to node on SAP Easy Access Screen as shown in the below screen shot. Step 2: Enter Equipment id and press enter or click on tick mark as shown in below screen shot. 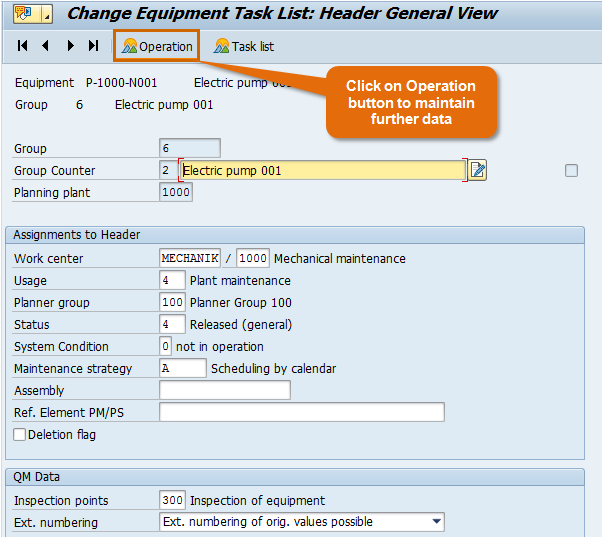 Step 3: Planning Plant and Main Work Center will automatically copied from Equipment Master Data. Group Counter will automatically update from system. Group is also updated internally from system. Here you must selected Usage = ‘4’ – Plant maintenance as shown in below screen shot. 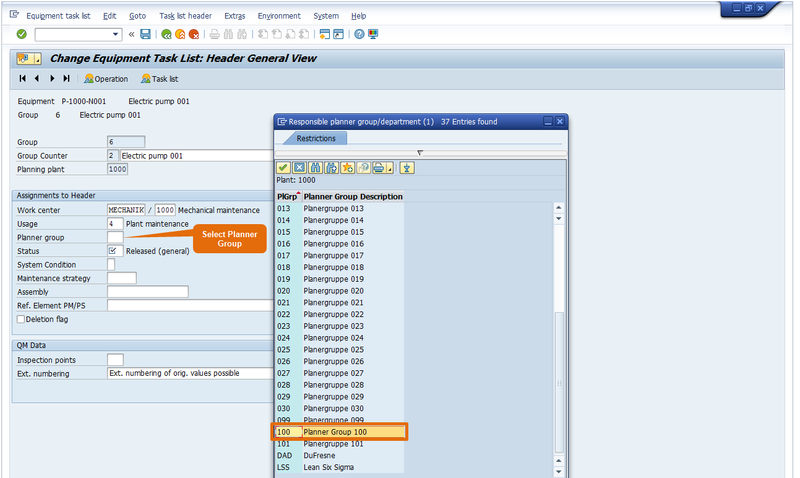 Step 4: Select Planner group from drop down. Step 6: Select System Condition. It shows the state of equipment during maintenance. Whether equipment will be in operation or not in operation when these maintenance operations will be performed. Step 7: Maintenance Strategy decides the cycle (frequency) of each maintenance operation. You can keep this field blank (for Single Cycle Plan) or select the maintenance strategy from drop down. 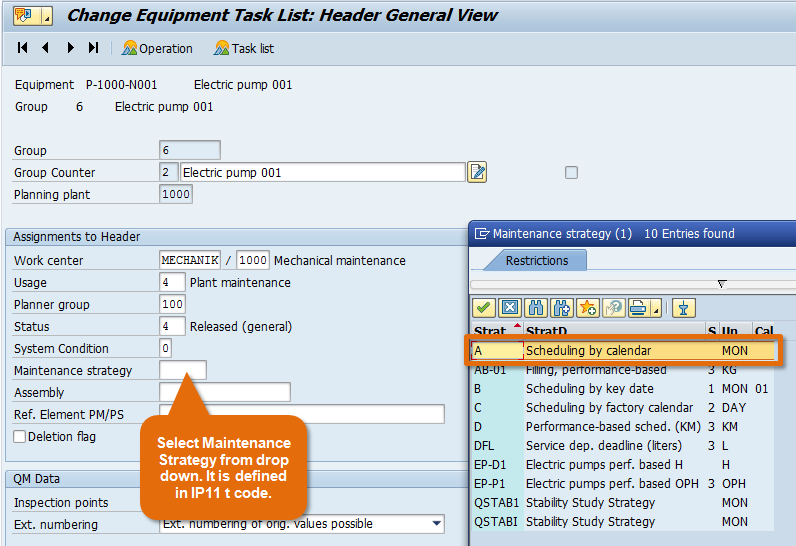 Maintenance strategy is defined in t code IP11. 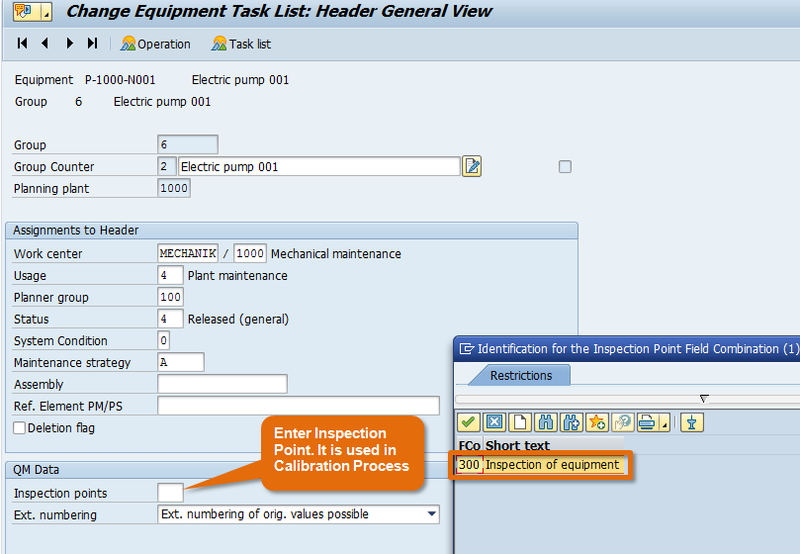 Step 8: Select Inspection Point = ‘300’ from drop down or else enter it directly. When you make an entry in this field, all sampling procedure data in the task list is used for inspection processing based on inspection points. It is used in Calibration Process. This is an integration between PM and QM Module. If you carry out calibration inspections and want to record inspection results for equipment or functional locations, choose the inspection point type for Equipment or Functional location. 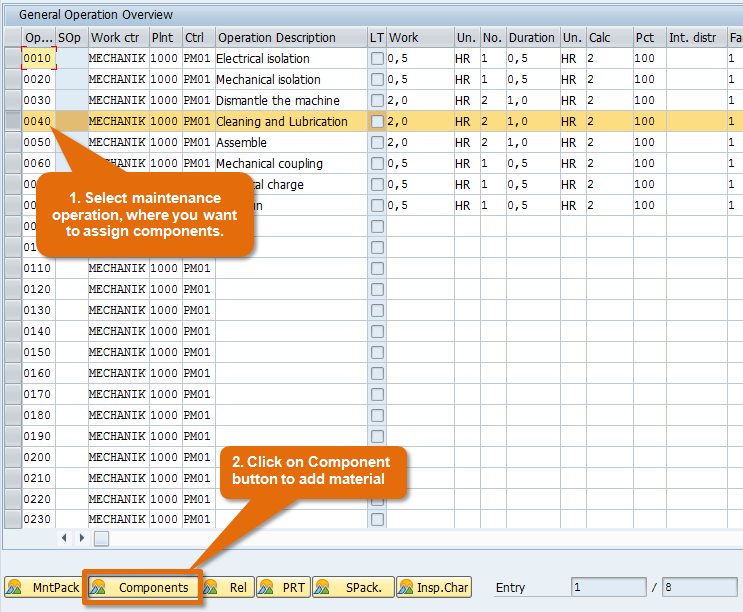 You can create your own field combinations for these inspection types in Customizing. However, the field Equipment or Functional location must exist in the field combination. if we fill field inspection point it will generate inspection lot even without mention inspection characteristic. Step 9: Click on Operation Button at the top as shown in the below screen shot. Step 10: See the below screen very carefully. It has very important information. 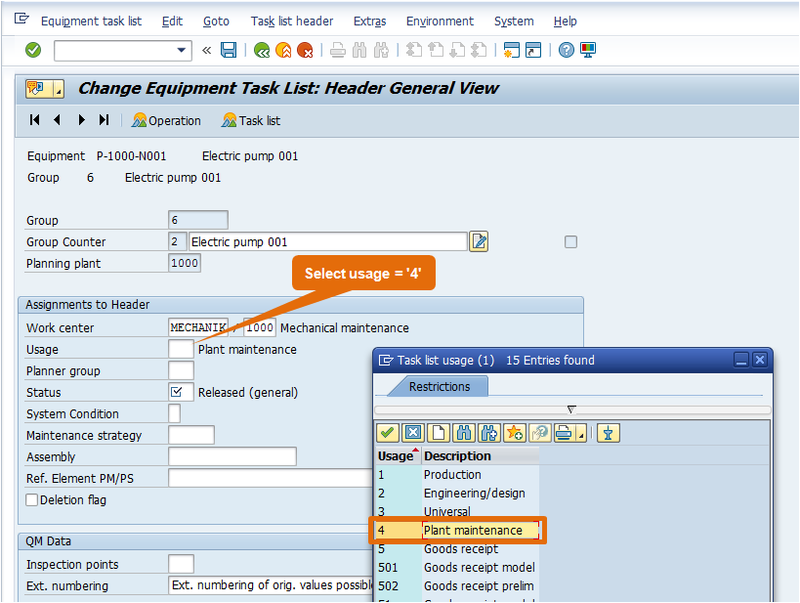 Main Work Center is copied from Task List header. Here you can see that it is maintained for each maintenance operation because it tells us who will execute the particular maintenance operation. Control Key decides whether operation will be executed internally or externally. Means if an operation is executed by our own man power then we will select control key as PM01. However, if we want an external person or contractor to do the operation then we select control key as PM03. Operation description give us clear cut information and sequence of maintenance activities to be performed on technical object. No. of persons means the count of persons who are deployed to execute the maintenance operations. Duration is the time taken by maintenance person to finish the task. Calculation Key is the indicator which decides the formula to calculate Work. Sometimes client does not want to calculate man hours. They only want to calculate duration, then they select calculation key = ‘1’. But generally we recommend to calculate man hours using Calculation Key = ‘2’. Activity Type is a very important function. It is copied automatically from Main Work Center data. It is defined by Controlling person. It contains the information of rate of man hours. When it is multiplied with Work (man hours), it give the cost of internal services. This helps in maintenance order costing. Do not confuse Activity type with Maintenance Activity Type. Both are entirely different. 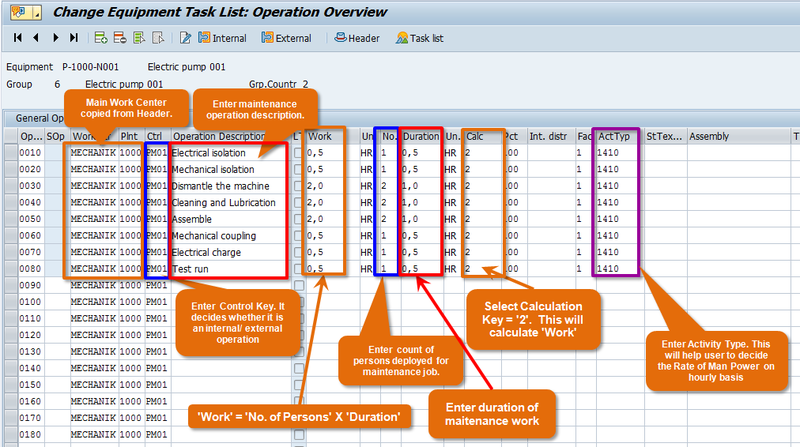 Integration : Assignment of Activity Type in Task List and Maintenance order is an integration of PM module with CO module. CO person creates Activity type using t code KP26. Even a PM consultant can easily learn step by step process of creating Activity Type. We will include a separate article on this topic in near future. 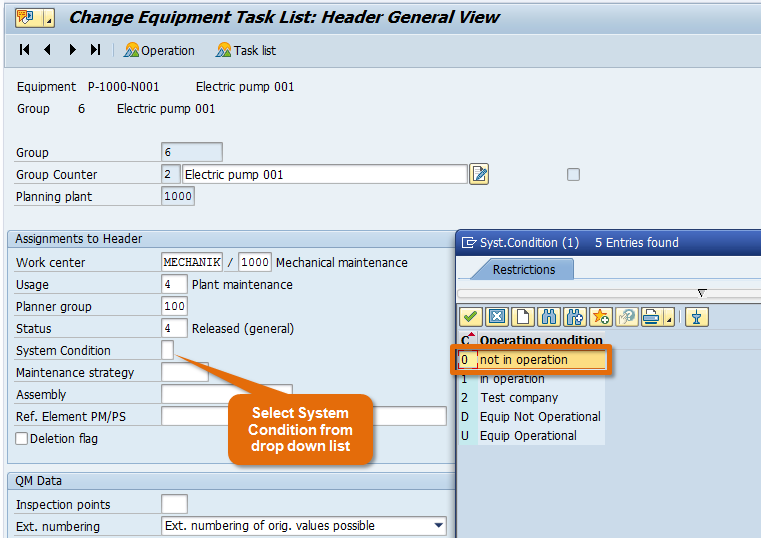 Step 11: Assign components (spare parts) to the operations wherever applicable. For example: For cleaning and lubrication maintenance person can have requirement of Lubricant or maintenance person wants to replace the bearing of a machine. To capture such information first select the operation for which you want to issue material from warehouse. Then click on Component button at bottom (as shown in below screen shot). 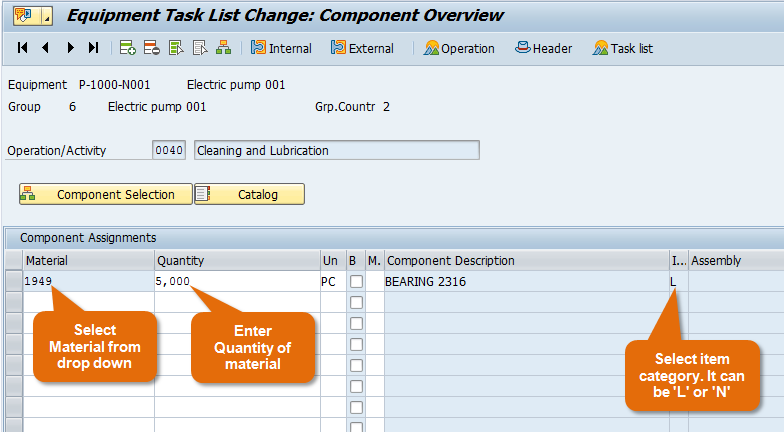 Step 12: A new screen will appear where we can select the material (spare part) and enter quantity. We can also select the relevant Item Category. If item category is ‘L‘, then material will be issues from warehouse through reservation. If item category is ‘N‘, then material will be procured through procurement cycle (PR -> PO -> GR). Step 13: If you want to execute a certain maintenance operation by an external agency (Contractor), then you must select the control key PM03. 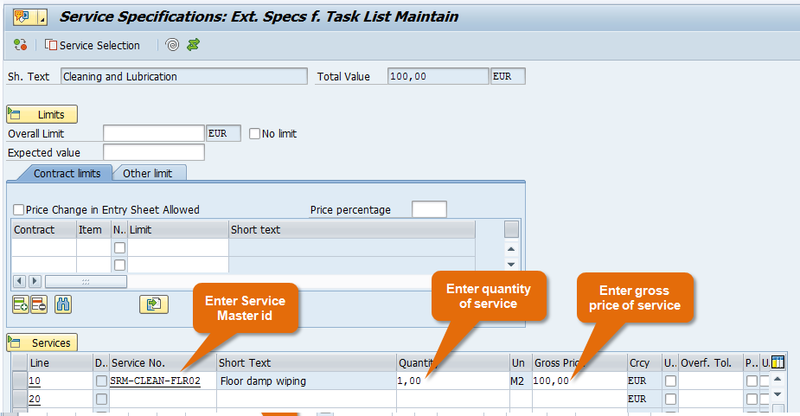 By using control key PM03, you can assign services from service master, quantity and gross price. This helps in calculating the cost of externally procured services in maintenance order. 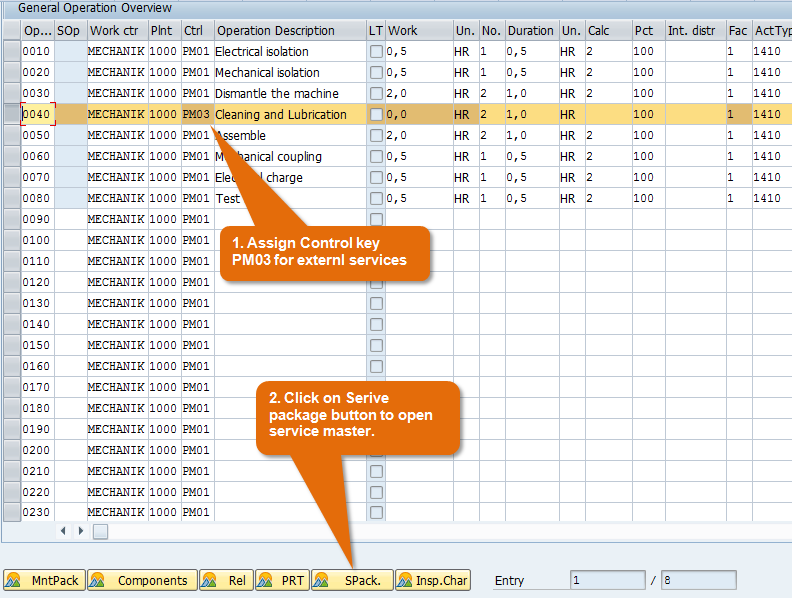 Step 14: Once you click on Service Package button it will open a new screen where you can enter the service master with quantity. Step 15:Click on back button and SAVE button. This will save equipment task list. 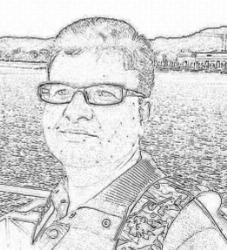 I m interested to do online PM training from sap pm consultant. Would u please refer me for that.